The lawmaker was facing calls for her resignation amid criticism she didn't move quickly to remove her chief of staff, who was accused of harassment by several women. 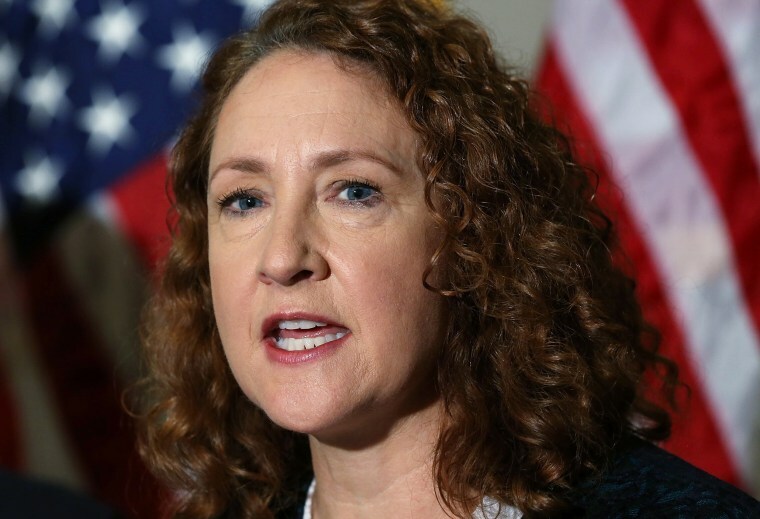 HARTFORD, Conn. — Connecticut U.S. Rep. Elizabeth Esty said Monday she won't seek re-election amid calls for her to resign because of her handling of a sexual harassment case involving her former chief of staff. The Democrat issued a statement saying she has determined it's in the best interest of her constituents and her family to end her time in Congress at the end of this year "and not seek re-election." Esty is in the middle of her third term. Esty is again apologizing to a former female member of her staff who said she was punched in the back and received death threats in 2016. The man accused of punching her was not fired for several months, pending an internal investigation. Esty says she'll work to improve workplace protections during her final months in office. Earlier Monday, Esty asked the House Ethics Committee to investigate whether she did anything wrong in her handling of the firing of her former chief of staff accused of harassment, threats and violence against female staffers in her congressional office. She is as outspoken #MeToo advocate who has been accused of not protecting female staffers from the ex-chief of staff. Esty has said she regrets not moving along an internal investigation into the allegations, which revealed more widespread alleged abuse, and regrets providing "even the slightest assistance to this individual as he sought a new job." "Although we worked with the House Employment Counsel to investigate and ultimately dismiss this employee for his outrageous behavior with a former staffer, I believe it is important for the House Ethics Committee to conduct its own inquiry into this matter," Esty said in a written statement, acknowledging "it certainly was far from a perfect process." Esty said she wants the committee to "clarify whether there was any wrongdoing" on her part. House Minority Leader Nancy Pelosi, D-Calif., said in a statement issued before Esty announced she would not seek another term, "As Congresswoman Esty has acknowledged, her actions did not protect Ms. Kain and should have. Congresswoman Esty has now appropriately requested an expedited review by the Ethics Committee." Esty's announcement that she won't seek another term comes amid calls for her resignation from a growing number of state politicians in Connecticut, including fellow Democrats. Bob Duff, the Democratic state Senate's majority leader, was among the latest to urge Esty to step down in the midst of her third-term. Duff said Monday that he has spoken with Esty about his concerns, acknowledging it was a difficult decision to call for her resignation given her record in Congress. "However, no matter the hard work Elizabeth has exhibited and my admiration for her bipartisan accomplishments, the news of the last few days is certainly disheartening," Duff said. He said several points led him to call for Esty's resignation, including her reluctance to speak out publicly about the situation and using taxpayer money to pay her former chief of staff, Tony Baker, about $5,000 in severance. Staffers said Esty repaid the federal government last week with her personal funds. A spokesman for Baker told Hearst Connecticut Media and the Washington Post that he denies some of the allegations. A phone number listed for a Tony Baker in Columbus, Ohio, where the spokesman said the former chief of staff was living, was disconnected. In her letter to committee members, Esty said she learned through a third party in 2016 about possible misconduct by Baker involving a former staffer, who worked in her office from January 2013 to March 2015. Esty has said she fired Baker three months later after receiving an internal investigation report that revealed improper behavior by Baker that affected multiple female staffers. Before news of the controversy broke, Esty had issued press releases calling for tougher harassment protections for congressional staffers and was among those demanding that then-U.S. Rep. John Conyers, of Michigan, resign amid allegations of misconduct.